The art of filmmaking has often been considered a vehicle for embracing curiosity, creativity and culture. This year, thatâ€™s exactly the theme of the Cleveland International Film Festival’s 2018 program, running April 4-15. Through a dizzying array of films — 216 feature films and 253 shorts — representing a lengthy list of countries (72 this year), the organization hopes the theme will encourage filmgoers â€œto challenge and perhaps change the ways we perceive and interact with the world around us,â€ writes CIFF Board of Directors President Nancy Callahan. 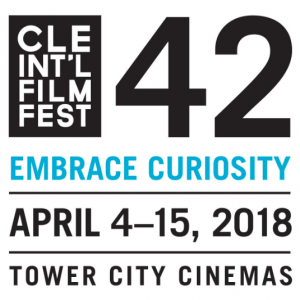 With over 500+ film screenings to be shown at Tower City Cinemas and several other neighborhood locations, CIFF upholds its mission of promoting artistically and culturally significant film arts through education and exhibition to enrich the life of the community. In addition to the screenings, there will be FilmForums, Chat Rooms, interactive media exhibitions, free screenings for college students, filmmaker Q&Aâ€™s (an estimated 300 guest filmmakers will be in attendance) and more. The Callahan Foundation is honored to support the 42nd Annual Cleveland International Film Festival with a grant of $15,000 towards the Roxanne T. Mueller Audience Choice Award for Best Film. Named in honor of the late Plain Dealer film critic from 1983 to 1988, the award is CIFFâ€™s most prestigious and internationally acclaimed honor recognizing impactful filmmakers.